Trying to get caught up here. I've had a lot going on at work lately and with the Ironman training a lot of my free time is gone. 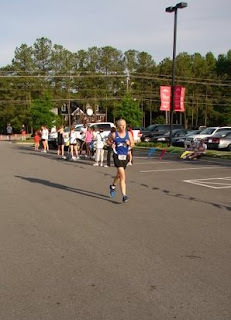 So, the day after the Clayton 5k and 51 mile bike ride it was time once again for the race held in Garner on Mother's Day. Last year I ran a very good 5k on an unusually cool morning. This year the race added a 10k but I wasn't planning to run it until I was able to get a comp'd entry due to The Athlete's Foot being a sponsor for the race. Even up until race morning I hadn't decided if I wanted to race it or just run with Karla again. With the hard workout the day before I wasn't expecting to feel too good but there was also a chance of winning an age-group award so I made the decision to go out hard and see what would happen. The usual suspects were here again. Bill, Margherita, Frank and Karla. Margo and Frank were running the 5k while Bill, Karla and I were in the 10K. My friend and co-worker Bobby Mack was also here to race for the 5k win and the $500 bonus for winning under 15 minutes. He had just won the Capital City Classic 10k the day before in 30:31 so he would be running on tired but confident legs. The weather was cooperating again and although not as cool as last year was much better than yesterday in Clayton. Karla and I headed out on the course about 30 minutes before to run a warm up mile. Along the way we ran into Rodney and Angie who were out for their morning workout and to come cheer on a friend. When we returned to the starting area I was happy to see that The Trail Angel, Laura had arrived to race again. But now it was time to get down to some serious racing business so we headed over to the starting line. I took off strong and was surprised at how good my legs were feeling. The first mile is mostly flat with a slight downgrade and then a nice downhill for a while to the one mile mark. I was hoping that it would be at least 8mp but was shocked to go through in 7:18. I was feeling good but that pace was way faster than I should be running. I backed off a little and settled in for the next 5 miles. I hard barely gone another mile when I heard footsteps quickly approaching. I looked and it was Bobby and Devin racing hard in the 5k. They had started 5 minutes after the 10K and were already blazing by us. Bobby said "Hi Joey" as they sped by and I could only marvel at the talent of those young guys. The 2nd mile was still fast but a more reasonable 7:45. I slowed even more the next mile which has a little bit of hill to climb back up to the starting area but I was able to pick it back up again in the 4th mile. Up to this point no one had passed me since the start but between 4 and 5 I was feeling the effects of Saturdays workout and my lack of short distance race training. Two runners were approaching and they both passed me by the 5 mile mark. I was able to hold on to finish in 49:37, exactly 8mp. Normally that would be disappointing for me but with the comeback from injury and the training I am doing right now, I was very very happy with that time and effort. Everyone had a good day. Bobby was able to pull away from Devin for the win and the bonus in 14:28 I think. And Laura was the overall womens winner in the 5k. The race went very well until they got to the awards ceremony and several mistakes were made. The worst was that Laura was not even recognized and got nothing. I was second in my age-group but not even listed because they had me entered mistakenly in the 5k so it looked like I was dead last in the 5k in the results.